This was written by Jaideep Khanduja on his blog here. It does not matter from which corner of India you belong to, it also does not matter if you need a support for a short span or for a longer duration; what it matters is that you have to come with a trust to SHEROES with a commitment that once you become part of SHEROES and revive back to your stable position with the support from SHEROES, you must, as a rule, pay back with a similar kind of support to another SHEROES in the making at some time in life, when you find one. That is SHEROES India, a committed platform for She Heroes (SHEROES), for every woman who makes a choice in her life, and makes it work for her. The platform is for women who want to live their own life in their own way, who dream and wish their dream to come true, who wish for their dream to come true and then strive for it and make all efforts to make it true. 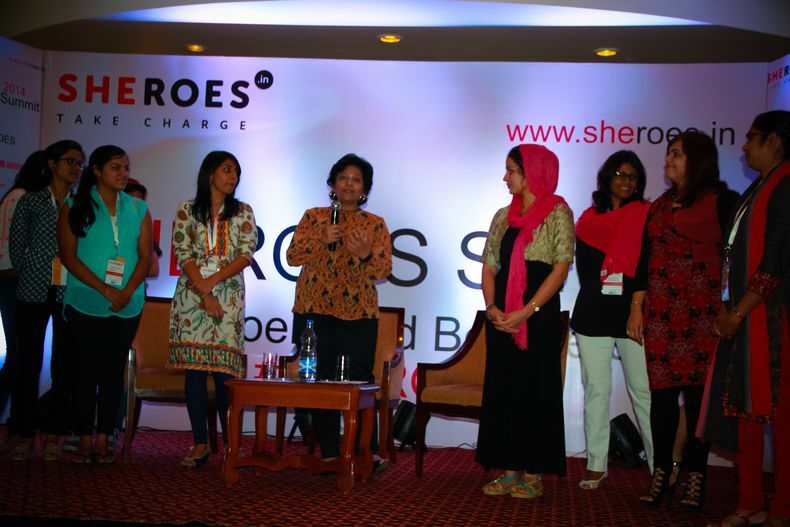 To salute to this cause and journey, Blogadda joined hands with SHEROES India for one day SHEROES Business Summit held on 4th November 2014. The same event is planned for 12 more cities of India to showcase presence, reason and journey of SHEROES among the local audience and letting more to join it. The purpose of this summit is to let people know how the meaning of entrepreneurship is being molded for women as per their needs thereby changing the whole game plan. This journey of 13 cities starting November 14, 2014 is ending in Kolkata on January 22, 2015 routing through Mumbai (Dec 9), Pune (Dec 11), Hyderabad (Dec 20), Bangalore (Dec 22), Lucknow (Jan 10, 2015), Ranchi (Jan 16) and finally Kolkata (Jan 22). The summit was quite impressive, well-structured and full of insights. There were speakers from India’s organizations that are most women friendly in providing them the flexible timings and work structure. There were remarkable successful celebrities from the fields of entertainment, business and other areas. There were insights about how the organizations are changing their engagement models for women thereby making it an equal avenue for men and women. For the first time women are being given equal value and weightage in the work place. So far everything was being expected from them as per opposite gender’s ways. There were women from various fields and streams with a number of years of experience in many good organizations, who decided to call it off, to work for others, and start their own ventures respectively. Overall it was an insightful event with a genuine cause.